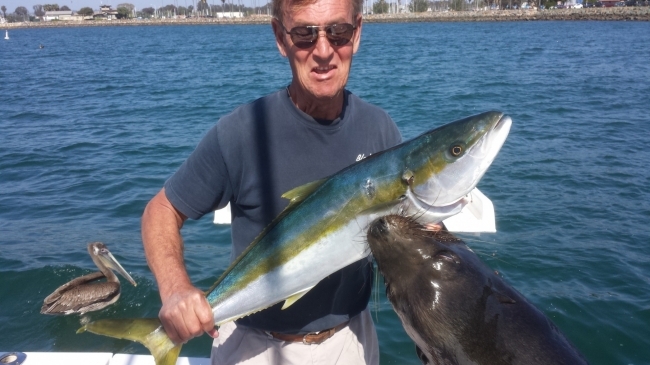 Fisherman of 30 years Dan Carlin was posing with a big yellowtail he caught in the San Diego Bay on Easter Sunday for a picture for his wife Trish, when a sea lion grabbed him by the hand and dragged him into the water. Before Trish began the final fish, she said she wanted to take my picture. I grabbed a fish and hoisted it up. The sun was reflecting off her cellphone screen, so she was really concentrating. She said “Smile!” and pressed the button. When she looked up, I was gone. I was in survival mode. I was fighting to get my hand free, and after a lot of struggling, it finally let me go. I was kicking to get back to the surface when it swam back and took a bite out of my ankle. My experience of free-diving saved my life. When I went over, I didn’t open my mouth. If you do, seawater forces its way into your lungs and you sink like a rock. The water pressure could have blown out my eardrums, but I equalised the pressure by swallowing. When I surfaced I could hear my wife screaming my name. The whole thing lasted no more than 25 seconds. I climbed the ladder on to the boat and lay down. Every breath felt like agony. There was a huge hole in my hand, the blood was gushing out. Trish wrapped it in a towel. I knew I had to get to hospital, but first we had to hoist the anchor up the last 6ft.